Happy Sunday everyone! I hope you are having a lovely weekend so far. It's been a busy (and tiring) weekend for us. My daughter and her team competed in the State Pennant for gymnastics yesterday. The girls did really well and came 2nd on floor, 3rd on fault and 4th overall. I'm so proud of how well they have all done throughout all of their competitions, especially the State Pennant. The competition was definitely a lot tougher and with more girls than ever before. Anyway, I'm sure you aren't here to hear about my daughter's gymnastics. 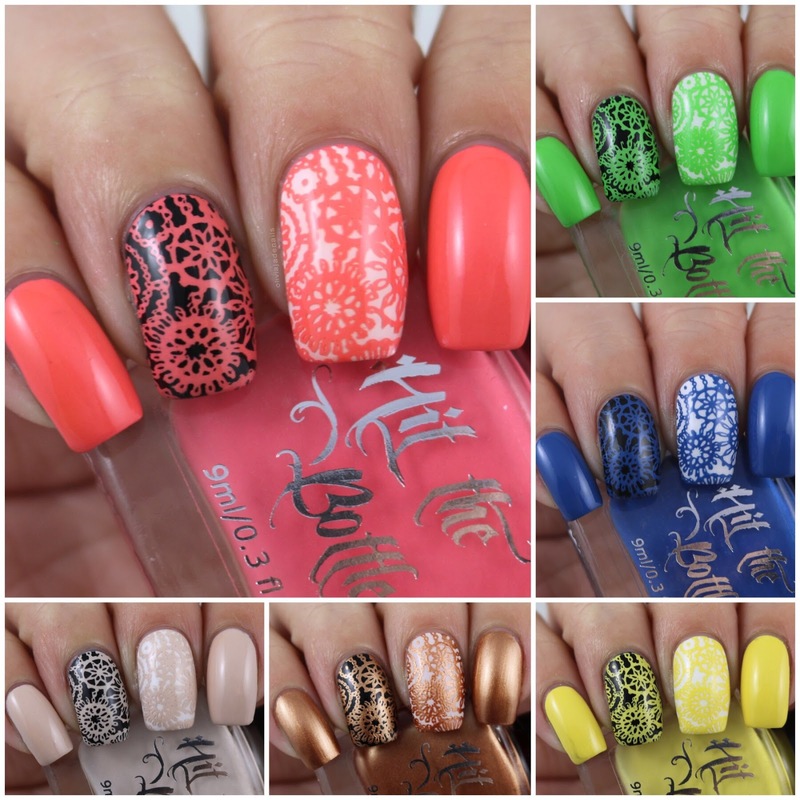 Let's talk about one of the new Lina Nail Art Supplies plates - Make Your Mark 08. I do have a few of the other new plates that were recently released as well but I will be sharing those at a later date (aka when I have had a chance to swatch them). I was swatching my way through piCture pOlish polishes I purchased earlier this year the day that this plate arrived. 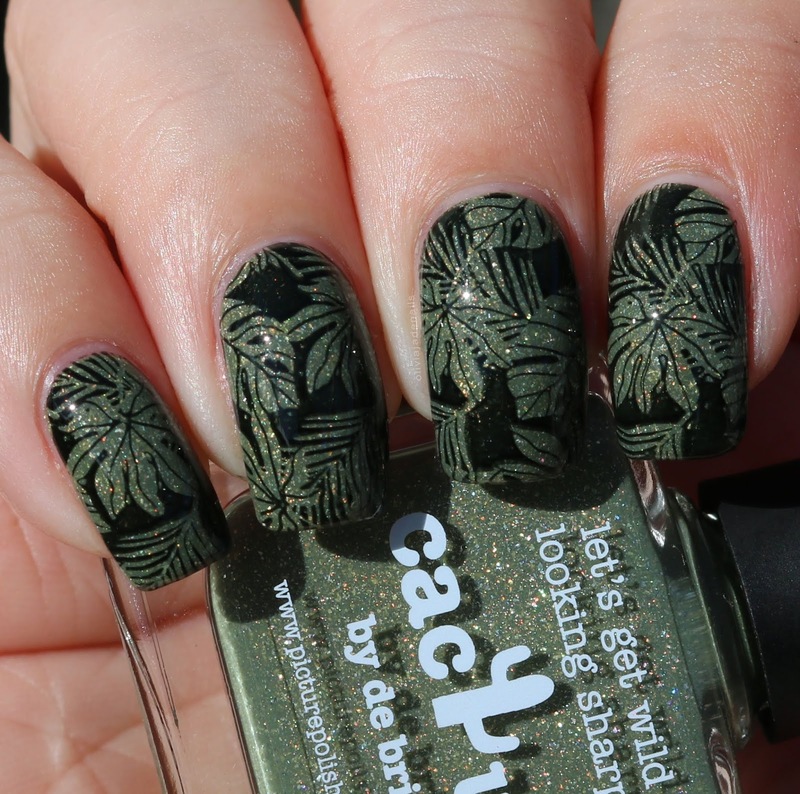 As soon as I saw this leaf design I knew it would be perfect with Cactus. 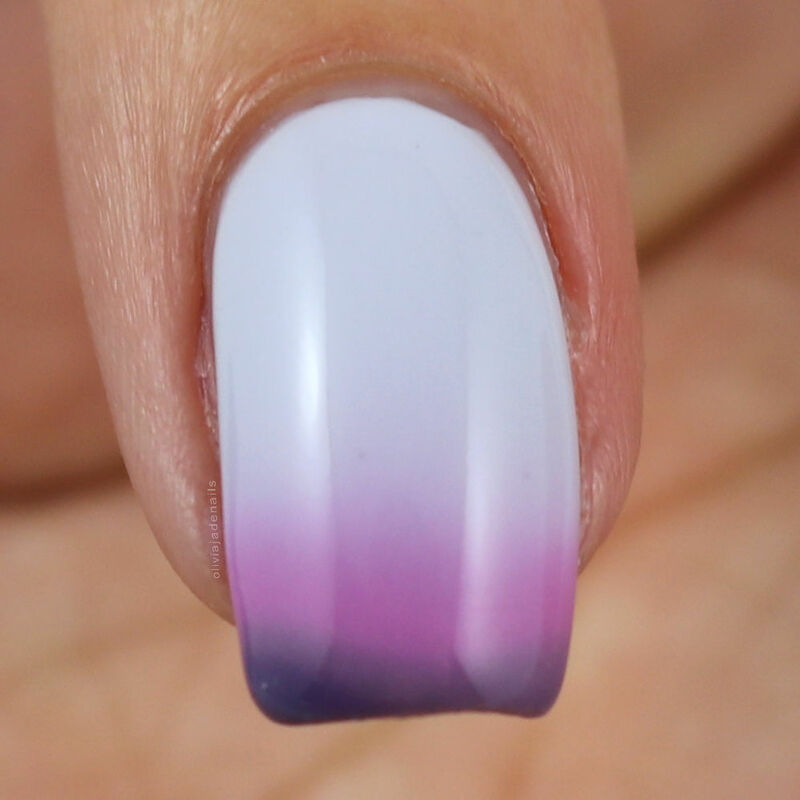 I love how this mani turned out. Yes it's simple, but it's so pretty. 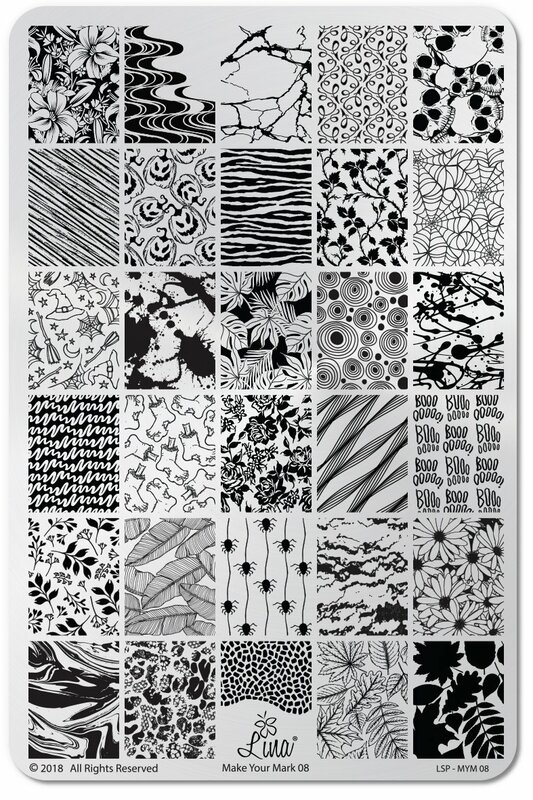 I think this image would also look great with a multi coloured base too. 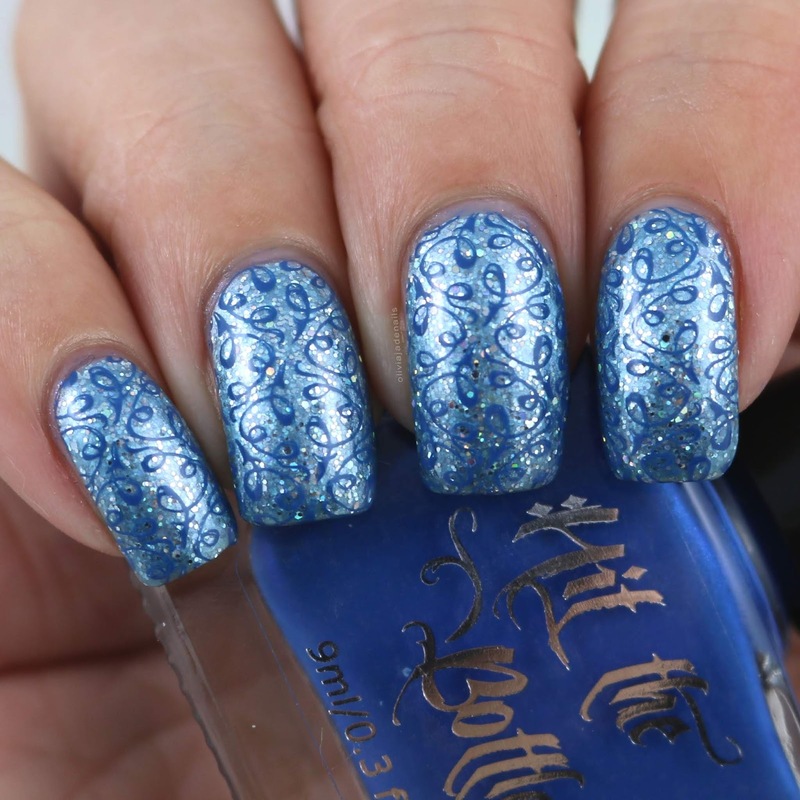 Along with this plate I was also sent some of the new stamping polishes from Hit The Bottle. 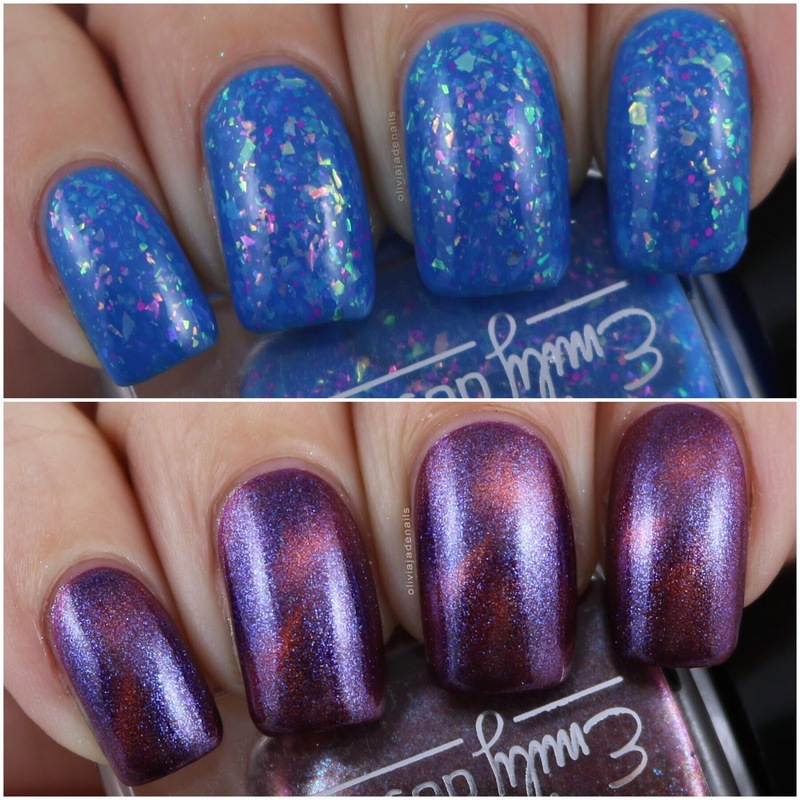 I had them sitting in my polish racks to swatch and thought that these colours would make for a great base. Polishes used are Hit The Bottle Peaches N' Scream, Slime After Slime, Banana Colada and As Black As Night. I really like this delicate print. I think it's really pretty. 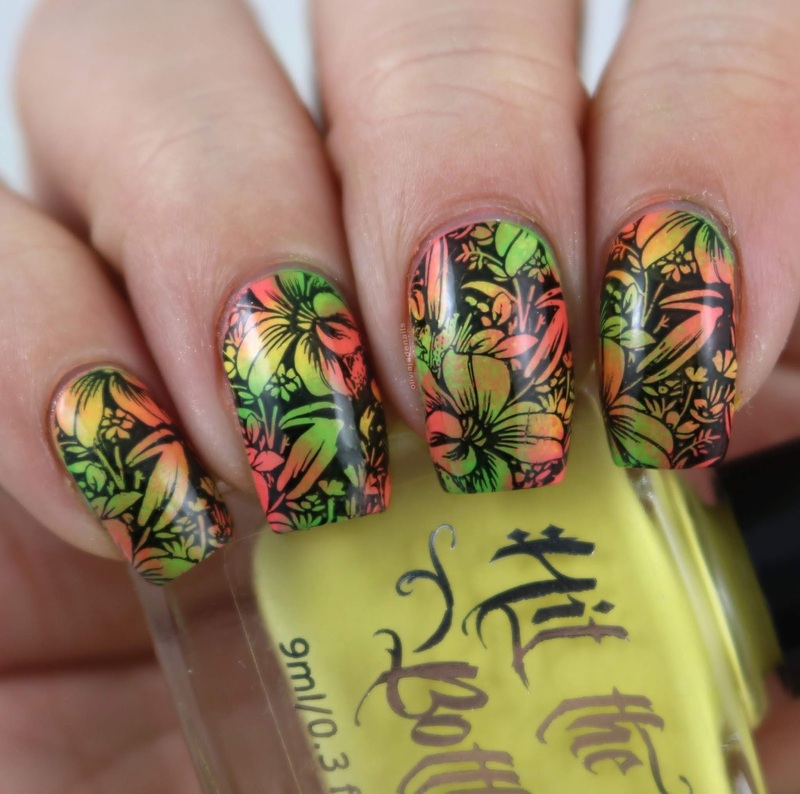 For my base I used China Glaze Deliciously Wicked and stamped using Hit The Bottle Beware The Bates Motel. Oh layered images - how I love and hate you at the same time. It's been quite some time since I have done a layered mani and definitely an even longer time since I have used a Lina plate for a layered mani. I know this isn't perfect (like I said it's been a long time lol) but I still quite like how it turned out. 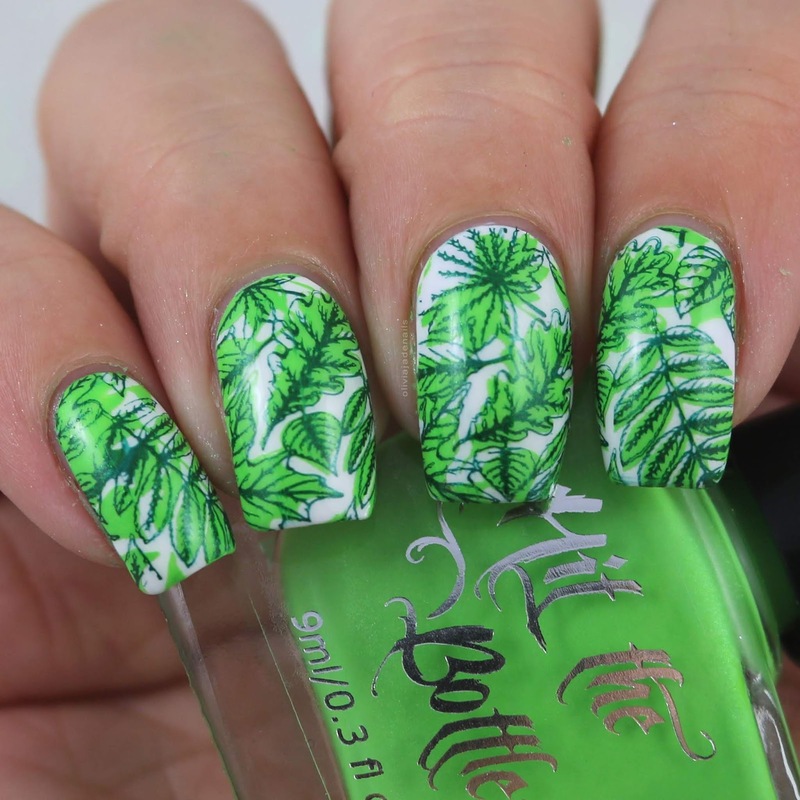 For this mani I used Emily de Molly Bright Retreat for my base and stamped using Hit The Bottle Slime After Slime and Powder Perfect Metallic Green Stamping Polish. This next image gives my oil spill vibes. I don't know why but it does. Anyway, I am definitely disappointed with this image. I don't think that it is etched properly. I couldn't pick it up whole. It had parts always missing. 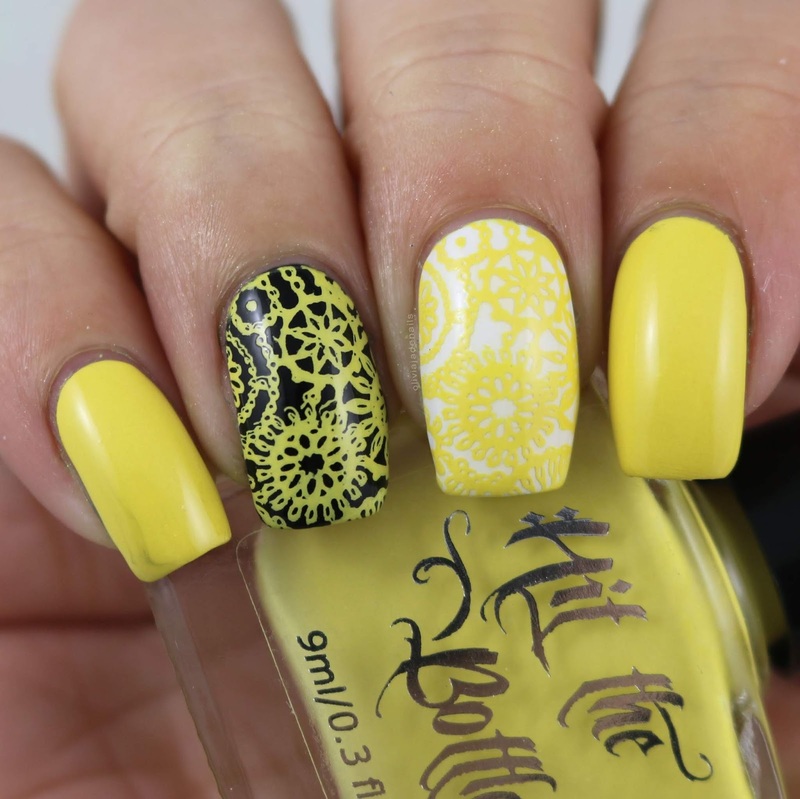 I tried the usual swiping at different angles, pressure etc and with multiple stamping polishes and it was the same issue over and over. 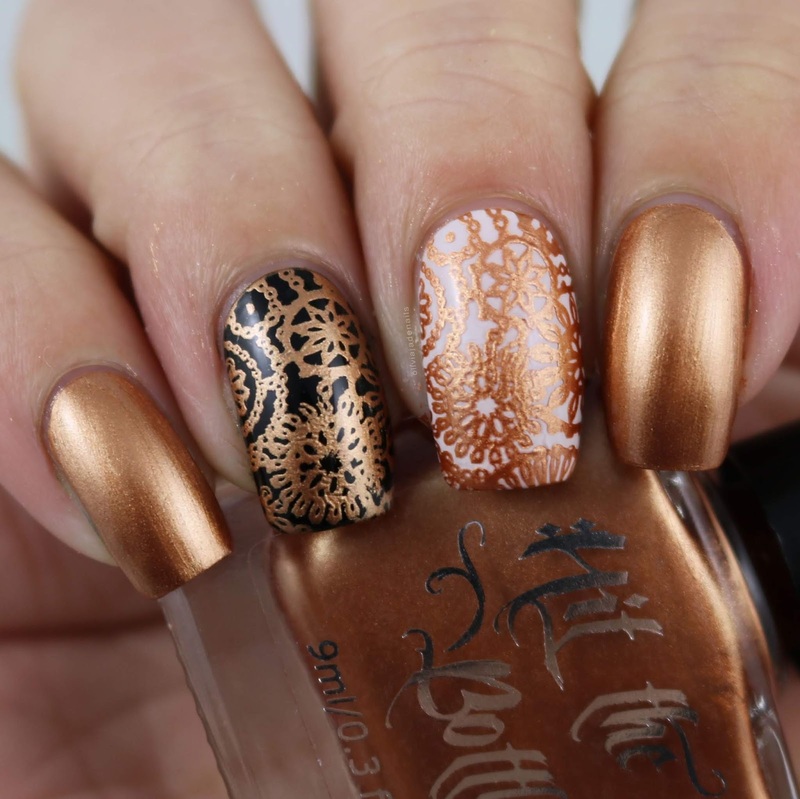 I also used the same stamper that I have used for all of the other manis in the post (and thousands before) so it's definitely a fault with the plate. For this mani I used Pretty Serious Cosmetics Absence and Colour Alike B An Orion. My thoughts on this plate - I really like it. I think there are some really great designs on this plate and I can see myself using it a fair bit. I am disappointed that I had some much trouble with that one image. I am hoping it's just the one image and not others on this plate but I guess time will tell. This definitely isn't the first time that I have had issues with some of the images on a Lina plate. Let me know if you have this plate and if you also had issues with the image in the bottom left corner. 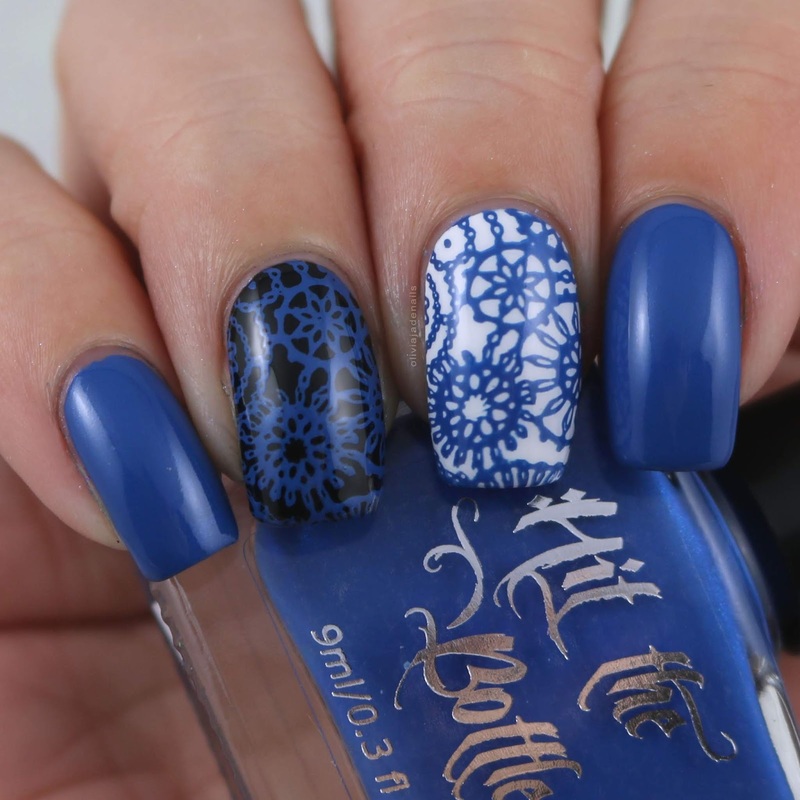 The Make Your Mark 08 Stamping Plate is available now from Hit The Bottle and Lina Nail Art Supplies. Late last week I received some surprise nail mail from Sally Hansen. 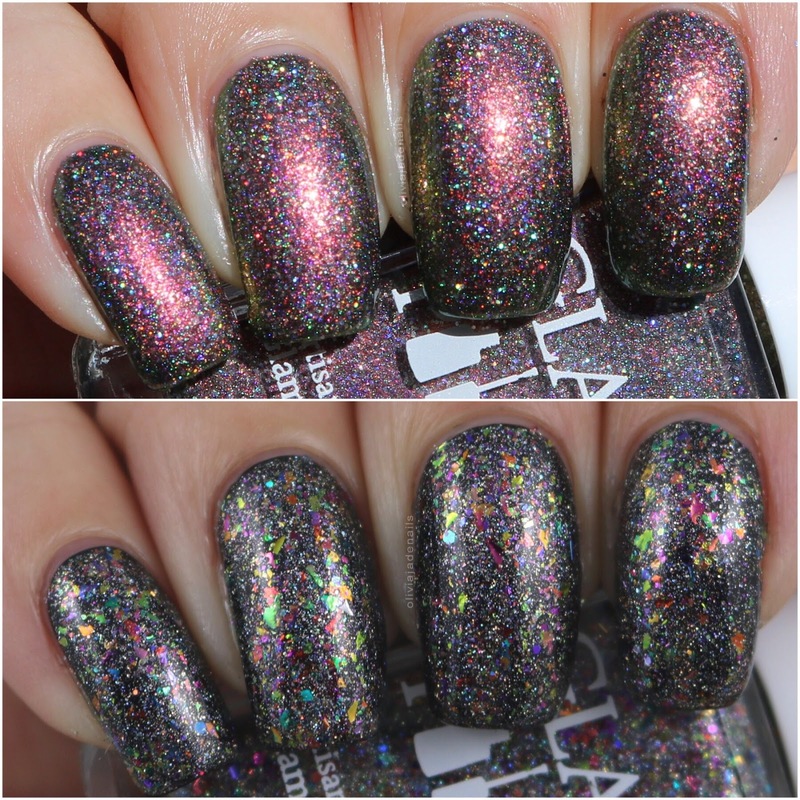 Now I am not 100% sure if this polish is a new polish or not, or if it's from a specific collection or something. 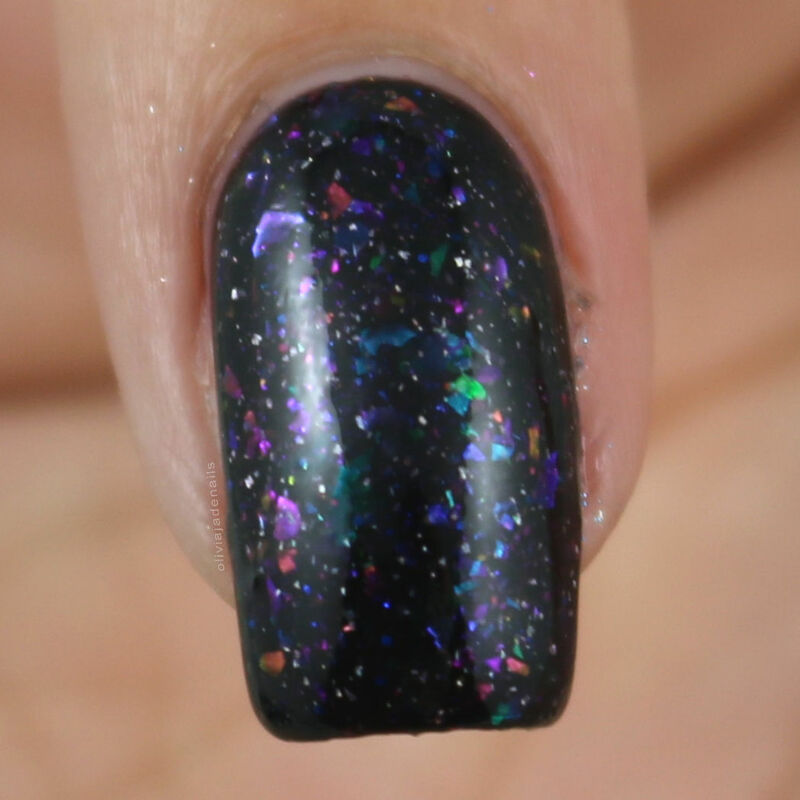 This polish really was a complete surprise for me. So now I have a very quick post for you. Ocean Daze is a pale mint blue creme. I think this is a nice colour. The formula is what you would expect from such a light shade - it applies unevenly and needs three coats to even out and to be opaque. 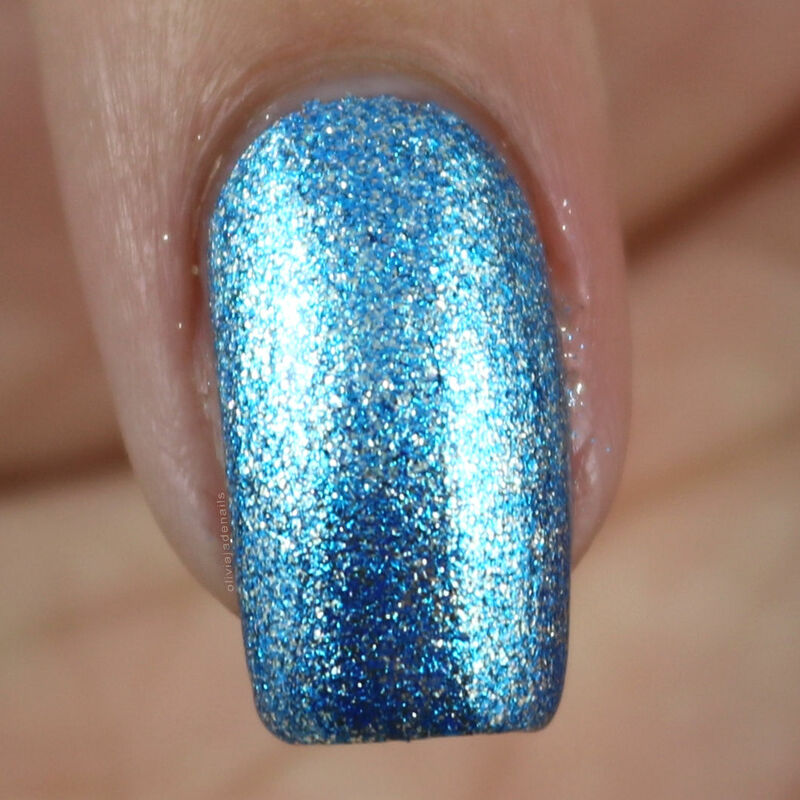 I'm really not sure what else I can say about this polish. It is nice but it's not a favourite of mine. Before I jump into today's post I just wanted to share that today's post is my 1000th blog post! Woohoo! I can't believe how quickly this has popped up. I started blogging back in February 2015 (with a Grace-full Nail Polish post so having another Grace-full post is quite fitting) and never did I think that I would ever write 1000 posts. When you break it down, that is a whole lot of writing and even more mani time! But let's not talk about that, it's a very scary thought but I really enjoy blogging. Now I know I said this before (and I will continue to say it) thank you to everyone who takes the time to stop by my blog and/or leaves a comment. I hope that you enjoy my posts as much as I love doing them. If there is anything that you would like to see on my blog feel free to let me know. 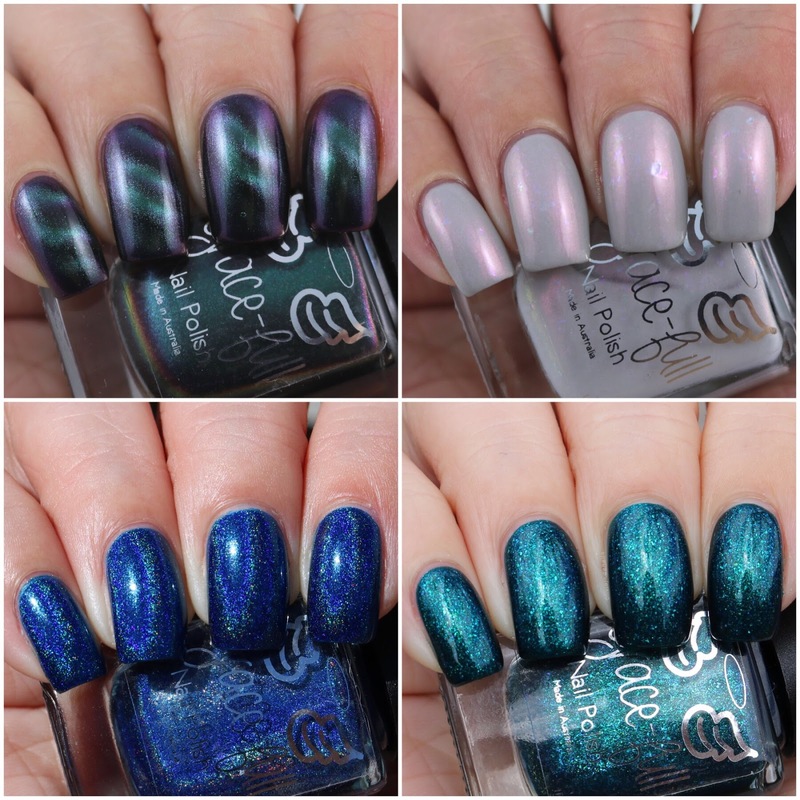 Earlier this week I shared with you a new collection from Grace-full Nail Polish (the Nolite Te Bastardes Carborundorum Collection) that is being release this week. Well today I have another new collection that is being released at the same time. Yay for being able to save on shipping costs! This collection is the Christmas 2018 Collection. Yes, that's right - Christmas. Everyone is starting to roll out the Christmas things to ensure you have plenty of time to grab yourself (and others) some pretties to celebrate the upcoming holiday season. Frosty is a combination of blue and silver metal flakes. This is such a shiny polish. I'm not sure pictures really do it justice. The formula is great and easy to use, however clean up is quite tricky. I definitely recommend a careful application. For my swatch I used two coats. Golden Rings is a silver, peridot and red metallic flaked polish. 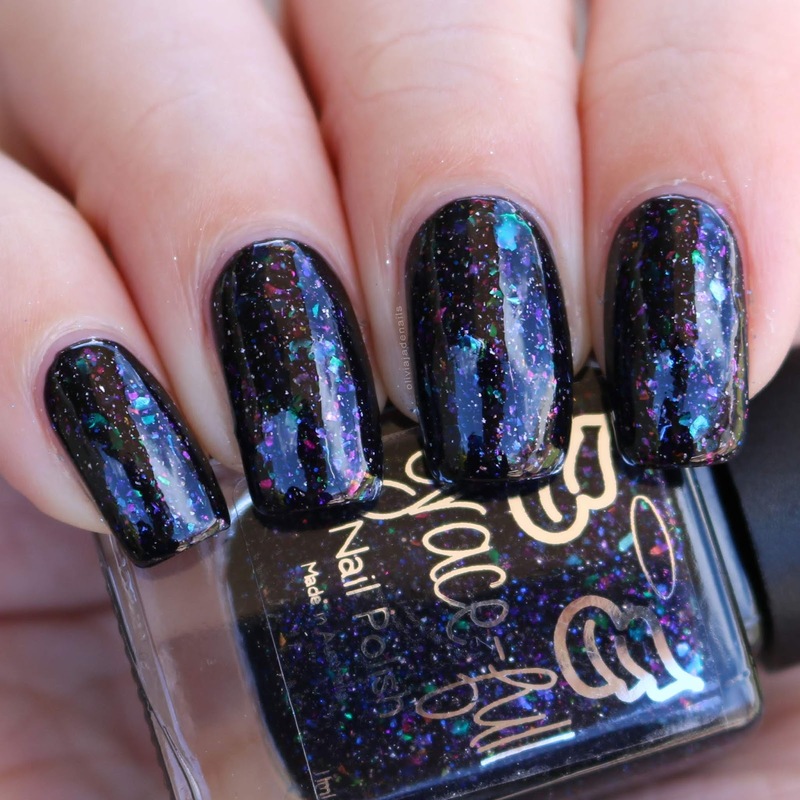 This is such an interesting polish. It very much looks gold until you look closely. It doesn't really have any gold in it. Like with Frosty, this one is very shiny that pictures don't really do it justice. The formula is also really good but again clean up can be tricky so I do recommend a careful application. For my swatch I used two coats. 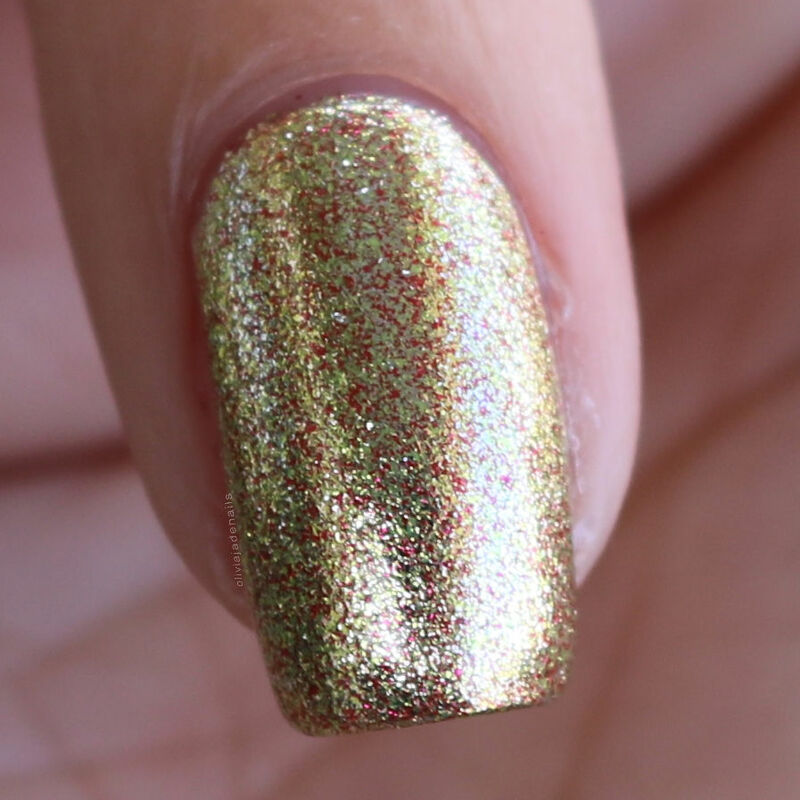 Kringle is a mid red to mid green thermal with gold and silver microglitter. This polish isn't really my cup of tea but the formula is great and it transitions well between the shades. For my swatch I used two coats. 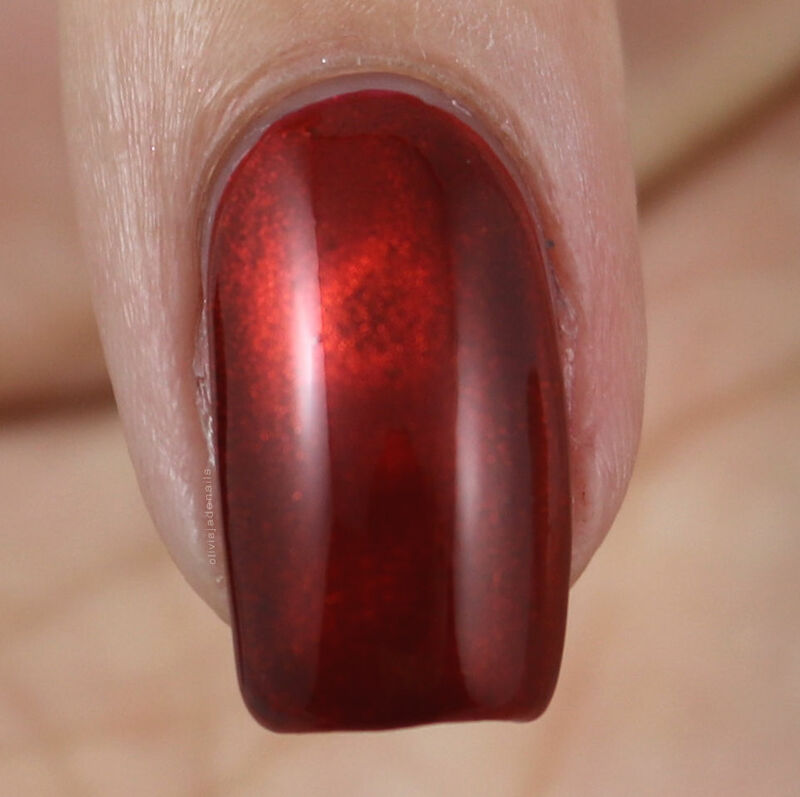 Merry And Bright is a crimson red magnetic polish with lighter red magnetic pieces. 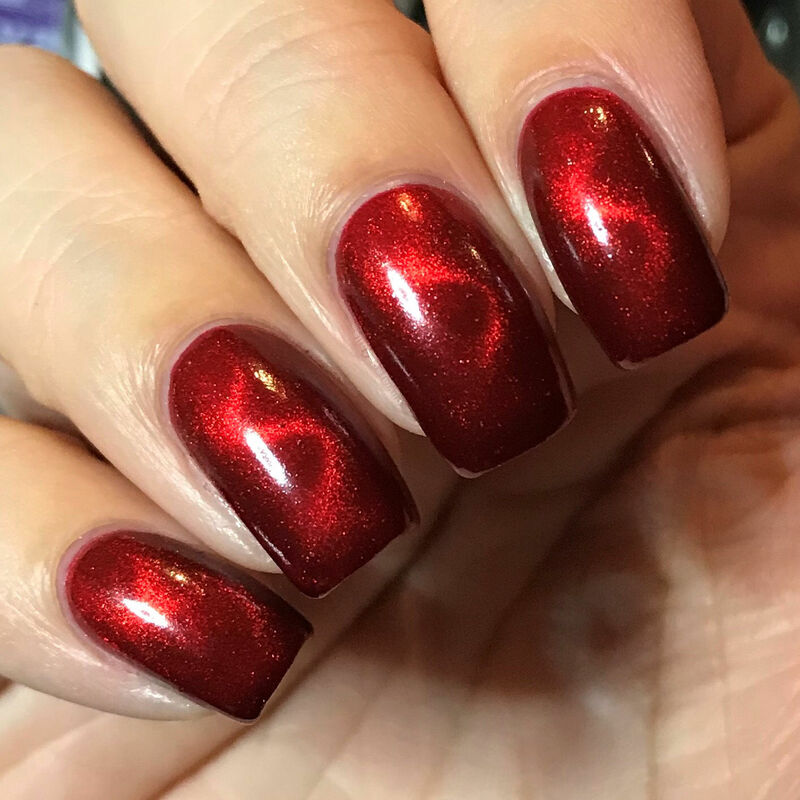 Now we all know that red isn't really my thing but this one I really like! Especially with the magnetic effect. The formula is awesome and applies like a dream. I used two coats for my swatch. Now I will go ahead and apologize for the weird picture (the last one). I took this picture before I added top coat and I loved how it looked. 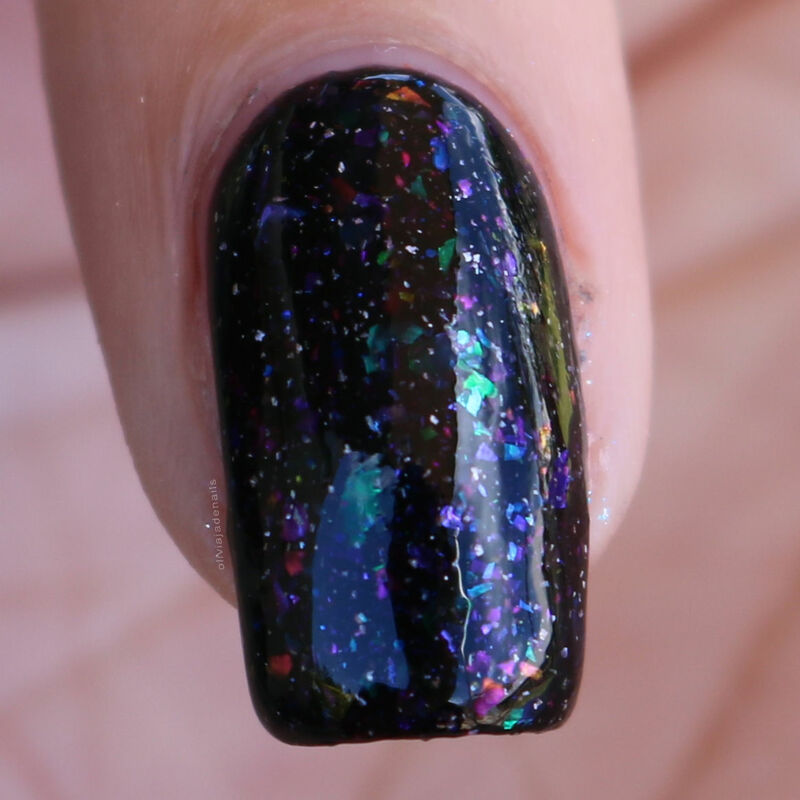 My top coat does like to make the magnetic effect dance around a little as it dries. 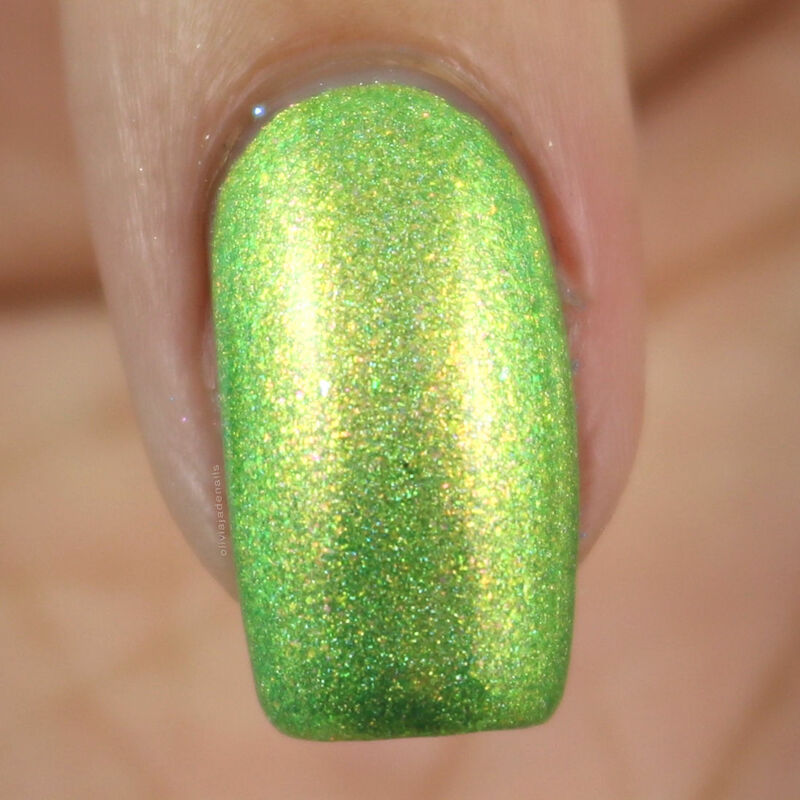 Mistletoe is a lime green with a super strong gold shift caused by the aurora shimmer all in the linear holo. This is such a cool colour but I am not sure I like it on my nails. The formula is great and easy to use but I did find it to be a little one the sheer side (well at least for my personal taste). My swatch shows three coats. Those Christmas Lights is a black jelly filled with multichrome and iridescent crystal chameleon flakes with holo flakes and holo microglitter. It is noted that this polish does have an unpleasant aroma (caused by the flakies) in the bottle but it disappears on the nails. I didn't experience this but maybe I have just had too many polish fumes that I am immune to it. 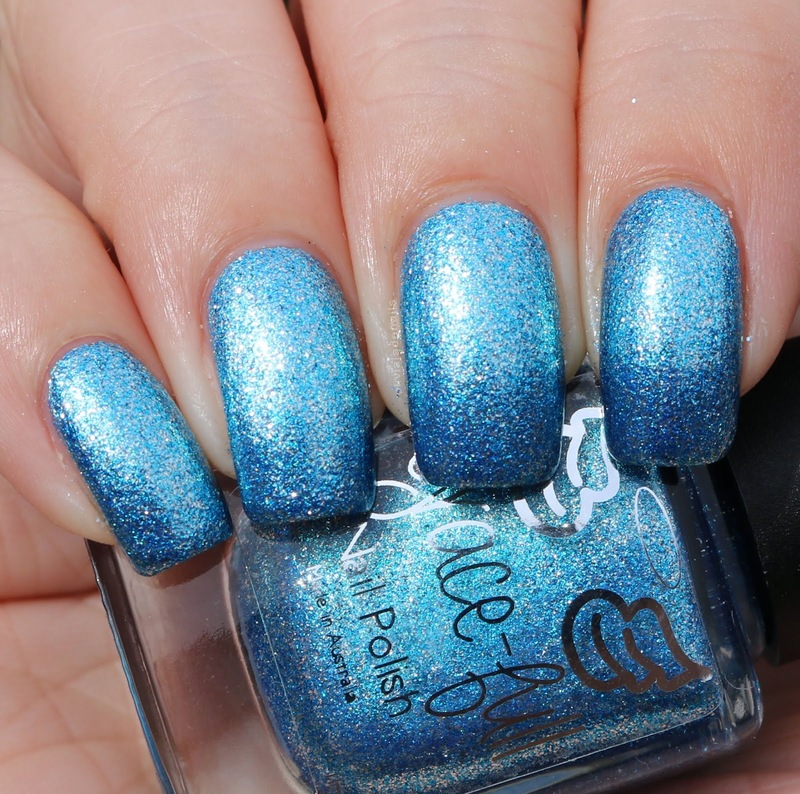 Anyway, this is another really pretty polish with a great formula. For my swatch I used two coats. 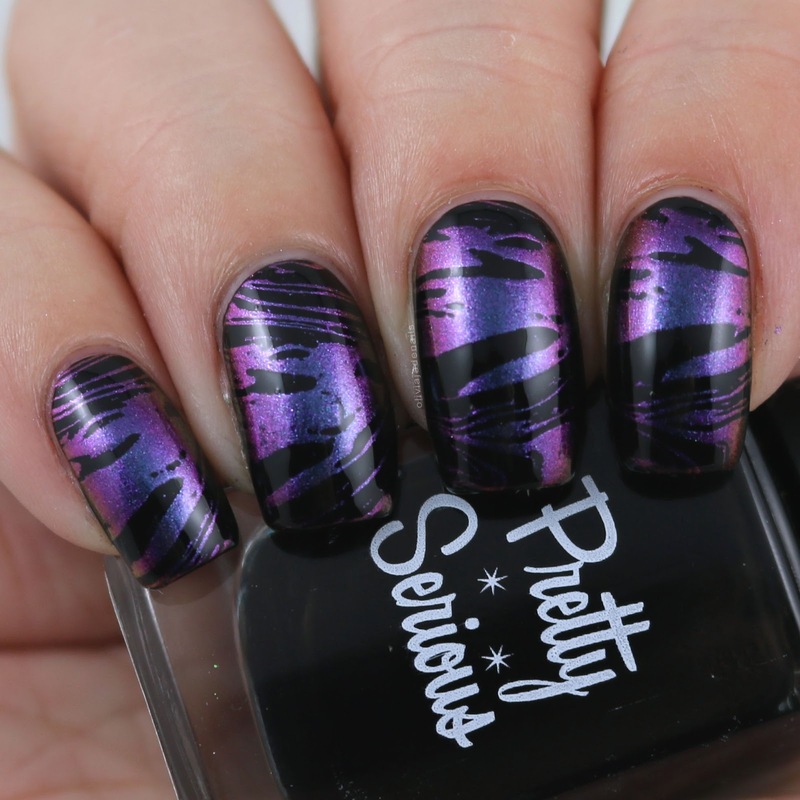 Winter Wonderland is a triphase thermal that moves between a very light grey, rose pink and grape purple. I really like all three colours in this thermal. They are all so pretty and they transition really well. When I swatched it was quite warm so I struggled to keep this in it's cold state. Ice was only helping so much. The formula is good and easy to apply. I found that it was a little on the sheer side in the warmest state so I used three coats for my swatch. 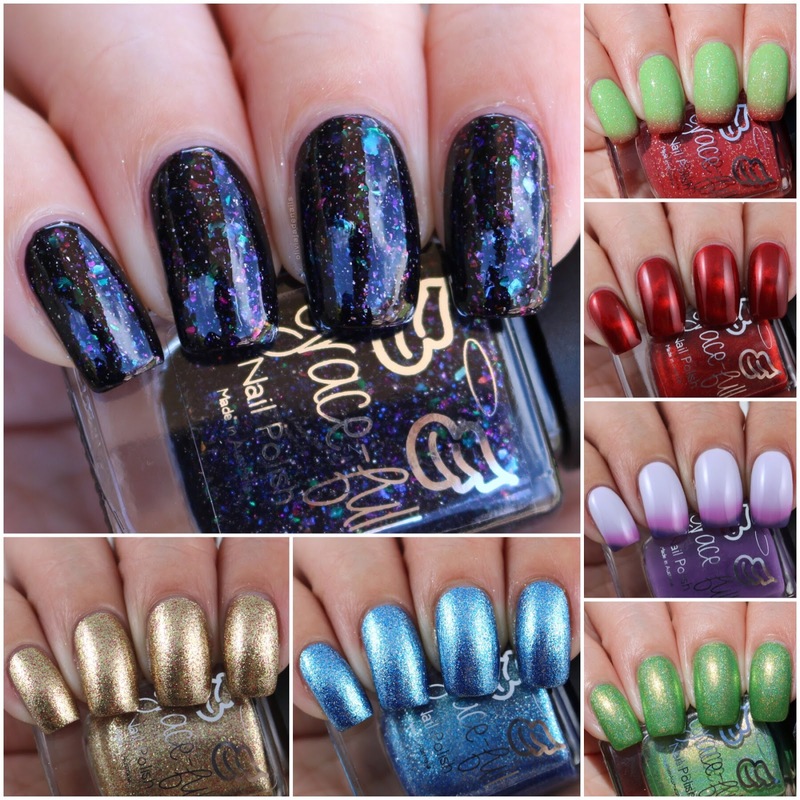 And there you have it - all seven polishes from this year's Christmas Collection. What do you think? I really like that this collection doesn't completely scream Christmas. It means you can wear each of the polishes all year round. 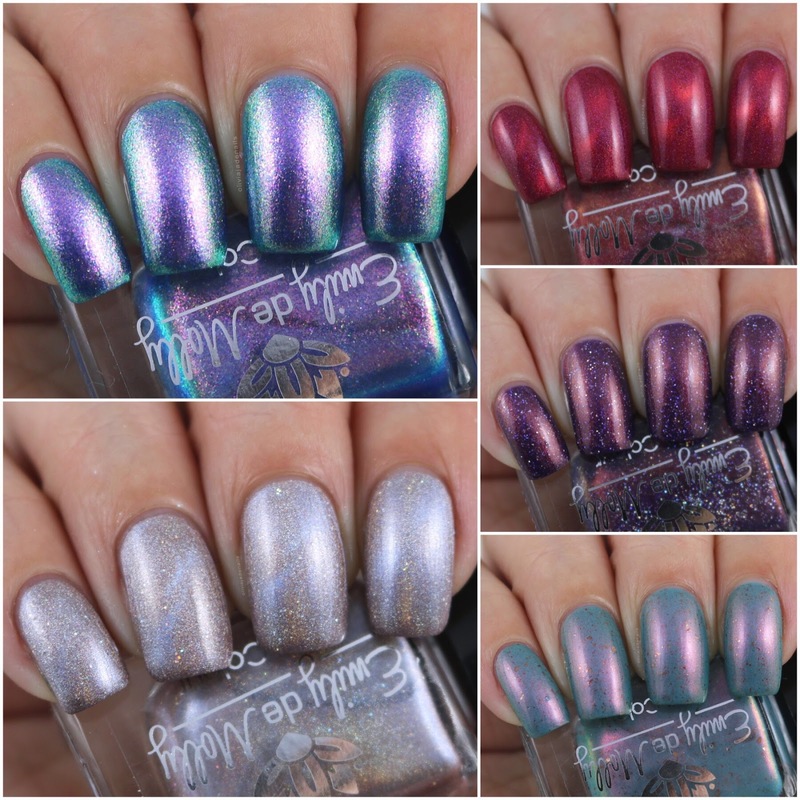 My top three polishes from this collection are Winter Wonderland, Frosty and Golden Rings. The Christmas 2018 Collection will be available from Grace-full Nail Polish on October 26th at 8pm AEST on the Australian site and October 26th 5am CT on the international site.